Courtesy Peter Freeman, Inc. New York / Paris and the Estate of Charlotte Poseneske, Frankfurt on the Main. The Sixties were a time of pushing the limits of human experience, a time of social uprisings and palpable energy, yet, in hindsight, we see that changes fell short in so many ways. NOwhere without NO is a dialogue between artists from three generations and three countries (Portugal, Germany, Iran-US), yet who are bound through similar social and formal concerns today — at a time that is mirroring the extremes of the Sixties. In the May 1968 issue of Art International, at the height of her career, Charlotte Posenenske wrote a manifesto announcing her departure from the art world. She felt that art was not enough to address the pressing social concerns of that tumultuous time. “It is difficult for me to come to terms with the fact that art can contribute nothing to solving urgent social problems.”1 It was perhaps a logical continuation of her path to turn to industrial sociology, but her gesture of departure from art is what has come to overwhelmingly define her as an artist. 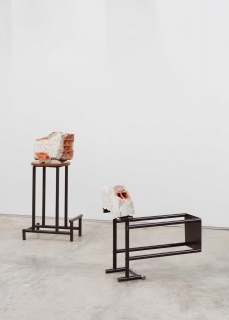 Fernanda Fragateiro and Shahrzad Kamel invent a dialogue between Charlotte Posenenske’s sculptures and early drawings, and their own works, created for the exhibition. Nine years ago, Posenenske’s first institutional solo exhibition in the US took place at Artist’s Space and every second weekend a different New York based artist was invited to change the configuration of the sculptures. "The things I make are variable, as simple as possible, reproducible. They are components of a space, since they are like building elements, they can always be rearranged into new combinations or positions, thus, they alter the space. I leave this alteration to the consumer who thereby again and anew participates in the creation.”2 Prolonging this gesture, Fernanda Fragateiro and Shahrzad Kamel will perform the changeable nature of the Square Tubes Series D conceived in 1967, rearranging the same elements to create different space configurations during the course of the show. Shahrzad Kamel usually works in the darkroom creating unique photograms, but for this project she returned to the camera, creating an image from a negative, going back to the inherent nature of photography as a medium of mass production. She built a replica of a Robert Smithson Mirror Stratum from 1966 as a departure point for a series of UV photographs, made of glass and mirror in factory cut aluminum frames. They will be installed in an expansible modular sequence. 1 2 Charlotte Posenenske, “Statement” [Manifesto], Art International no. 5 (May 1968).